PTFE lined hose is ideal for many applications thanks to its ability to resist extremely high temperatures while remaining non-stick and durable against abrasion and chemicals. SEMCOR has become one of the top suppliers and distributors to Midwest manufacturers and companies seeking PTFE lined hose and other products. We’re also a top fabricator of PTFE lined hose when you need a custom product for almost any application. The products we make and those we distribute are all geared toward providing longer service lives and less maintenance. 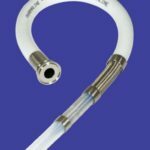 With minimum bend radii of 15 inches to more than 40, plus support for a significant range of PSI demands, we’re able to help you match the right PTFE hose for your needs. PTFE lined hose is perfect for ensuring fluids flow smoothly under desired pressure conditions in a wide range of applications, from chemical processing within chemical plants as well as any industrial manufacturing facility. The corrosion resistance and temperature support of PTFE hose provide significant flexibility for your needs as well. SEMCOR also supplies PFTE hose for companies specializing in power generation ultrapure chemical processing, and other industries. For any situation that needs to resist kinks while remaining extremely flexible or even resist collapse in vacuum applications, SEMCOR has the right PTFE lined hose for your operation. Resistoflex. Resistoflex invented the PTFE lined hose technology in 1953 for the aerospace and chemical industries, making them a top brand we’re proud to offer. Resistoflex’s PTFE lined hose provides a smart product that features an unmatched fluoropolymer performance and service life. Aflex. Aflex is another top brand for PTFE hose, and they recently unveiled its new Corroline+ Hose line. 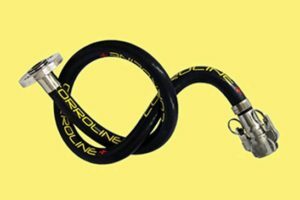 This hose combines the best in chemical needs for smooth insides and convoluted outsides. Ask about options that are kink proof and fire resistant for a wide range of applications. SEMCOR has provided fabrication services since our earliest days. We offer a full production and fabrication line that can help turn an existing PTFE lined hose into the perfect hose for your applications. Contact us directly to learn more about designing the perfect hose for your application. We’ll customize any PTFE hose and accessory. Fluid handling, material handling, damper drives and sanitary applications are all major focuses for us at SEMCOR. If you haven’t found what you need or aren’t sure about how to solve your problem, contact us directly right away. Our experts are here to help you find the perfect fit. No problem regarding conveying materials or fluids is too big for SEMCOR.